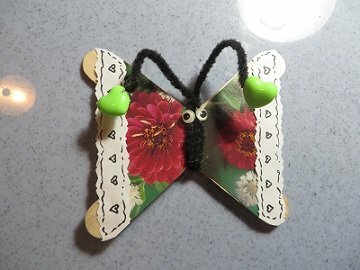 Let's recycle some greeting cards and turn them into a beautiful greeting card butterfly! 1. Hot glue the craft sticks into an X shape. 2. Use the front part of the greeting card only. Lay the X onto the back of it, hold it up to a lamp so you can tell where the design will be on your X - try not to get any words in the design. 3. Lay it down and carefully trace around the top & bottom of the X and draw a line between the top and bottom of the sticks at their ends to complete the wing shape. If your card is too small, you may have to do this with 2 triangle pieces instead and have the cuts meet in the middle, which will be covered by the body. 4. Cut the card and glue it to the X. 5. With decorative scissors, cut 2 strips of plain white paper to make the "lace" trim for the ends of the wings. 6. Hot glue that in place and then trim the excess at the top and bottom. 7. Use a Sharpie marker and draw some simple designs onto the white "lace". 8. 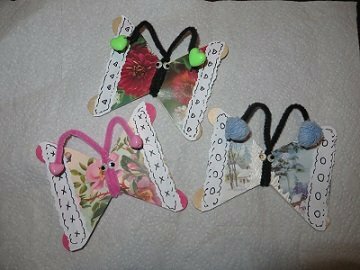 Place the chenille stem so there is approximately 3 1/2 inches above the middle of the butterfly and wrap it around the middle 2 times. This will leave the other end about the same length as the first end. Twist the 2 ends of the chenille together at the top of the head. 9. Hot glue the movable eyes in place. 10. Put a dot of hot glue on each end of the antennae to attach either a bead or pom pom. I love this idea. I always get some beautiful cards and this would be a great way to use them again to enjoy their pretty designs. Thank you for sharing!